At times, partners respond by saying something like, “That’s what I meant” or “That’s what I was trying to say” or “I wish I’d put it that way” or “What he said” or “that’s spot on” or “you’re good” or “Can we take you home with us?” I’ve (1) helped them express what they had been struggling to say but didn’t have or couldn’t find words for or (2) introduced a new way of thinking about the matter—a way they didn’t have before but that sounds good to them and, as a result of my suggestion, might now begin to have. Sometimes, partners respond to my doubling statement for them by saying something like, “That’s not quite right” or “That’s partly right” or “That’s almost it.” That’s a good outcome, too, since you can then say, “What would make it exactly right?” which will enable them to put their own stamp on it, make it more accurate, and state it in their own words. Partners generally forgive my errors as long as I accept their corrections. In fact, the immediate, nondefensive way in which I accept their corrections increases their sense of safety with me, strengthens our relationship, and reaffirms their role as the final arbiter in our joint effort to map their world. In other words, I have a Plan A and a Plan B. 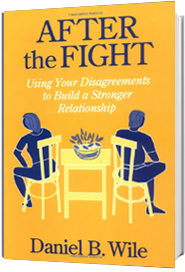 When partners make angry comments, the first thing I try—my Plan A—is to double for them in order to soften their comment. I turn their “you” messages into “I” messages, replacing their accusations with acknowledgments. If they don’t like my restatement—they think I’m being too Pollyannaish and saying it too nicely—I quickly shift to Plan B in which I restate a version of their original angry comment. I don’t want to whitewash their feelings or talk them into anything. And I don’t want them to lose the sense that I’m with them. I’m trying to match, even exceed, the angry content of Tamara’s remark. I’m going beyond it in saying, “At a time like this, it’s hard for me to remember what I like about you.” I’m trying to reassure her that I understand the depth of her feeling. On the other hand, I’m doubling for her in a nonangry manner, adopting a conversational rather than an angry tone of voice and reporting anger rather than unloading it. I hope by so doing to make it easier for Jacob to hear. As long as partners are able to tell me that my statements for them are too nice or off the mark, I can make adjustments. Problems arise, however, when partners have difficulty correcting me. They are reluctant to disagree with an authority figure, have a wish to please me, lack confidence in their own perceptions, or assume that I, as the therapist, must be right. A partner responded to the doubling statement I made for her by saying, “You’re 99.999 percent correct,” I said to myself, “99.999 percent? That’s virtually indistinguishable from perfect. That’s certainly good enough. I’ll let it go.” But then I remembered the guideline I set for myself: follow up on any slight hint partners give that my doubling statement is off. I asked, “Tell me about the 00.001 percent.” I’m glad I did, since what she went on to say showed my originally doubling to be totally off the mark. I’ve used that, ” Where am I right and where am I wrong?” or, “What part of that was right and what part was wrong?” with individual clients, too. It has helped because it does encourage them to correct me and express more of what they are thinking or feeling. Thank you for the reminders and information in this post! I love your work so much! You are brilliant and intuitive. I love the doubling, the checking in with the person, admitting you might be very wrong, backtracking when you feel you have gone in the wrong direction, staying connected with them, softening their comments to model this for them, and rightly hoping they may hear your voice reverberating in their ears as the days go by. You inspire me and others! Many thanks! Again, I think your contributions are really good, more than 99.999%. I especially liked what you do when you get it right: If partners respond positively to what I just doubled for them, I sometimes go on to say, “Would you like to say to (partner’s name) in your own words the part of what I just said that’s most meaningful to you?” I hope in this manner to spark an intimate exchange. That adds to the intimacy and moves the partners closer than if you have been the one doing the talking. The Plan B discussion is also spot on and something I pretty much already do, thanks to my own analyst and to self psychology. Why don’t you write up an article that includes all this practical, verbatim decision tree stuff. I think it would be a great contribution. Doesn’t need to be an entire book, just a compilation of your blogs. minute ?” Then I ask if I’ve gotten it right. I see now that some clients may not disagree or correct me even though I’m getting it wrong. 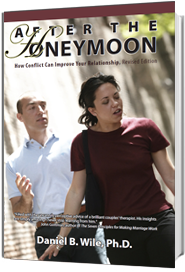 By inviting their corrections I see I’m also modeling for them how to disagree constructively (instead of with hostility) towards their partner and move to a place of greater understanding. Something else I’ve tried is to completely alter the client’s message. I may add, “And what I’m also feeling but not saying is…” I check this out with the client, of course, but I find that even if they disagree they may at a later time see that part of what I was saying was right. In the moment they may be unable to acknowledge their tender feelings but I’ve planted a seed. I appreciate all comments and learn. I have a rolling office chair that I move side to side as I double. I ask permission but sense I don’t introduce the process well enough. Clients often look wary although I do get participation. Could you help? I love the idea that even when we’re wrong we’re on the road to getting it right. And the very specific questions to make sure that’s what’s really happening. I have an off-topic question. Can anybody suggest any reading for a couple to take in on their own (a relative who’s had it with therapists) dealing with how two people who are in the process of going their separate ways after 30 years can still live under the same roof due to economic constraints? They don’t want to improve their relationship, they just want to share the house civilly, but there are still a lot of emotions all around. I hear more and more cases of couples who have really ended their relationship but continue to live together. Deep thanks for your work, Dan! I am so grateful for you and the sharing of your experiences working with couples. Thank you for taking the time to write these helpful lessons down for us. Thank you for another helpful blog. Particularly helpful was your description of “plan B.” Also, “Reporting anger rather than unloading it” is a small phrase communicating a very big and important process. I love this phrase. Finally, having been a participant in some of your workshops, it’s hard to imagine anyone perceiving you as anything other than humble and competent–far from an intimidating authority figure. Hello- your blog is reassuring and helpful- thank you for your newsletter! I am having good results from doubling. Last week I had an unenthusiastic agreement, noticed it but didn’t know what to do with it. Your blog pushes me toward letting the unenthusiasm surface. I think for this client within the couple it’s an authority figure issue. Wondering how else you manage that power struggle. Best regards. Hi Dan, Thank you for another helpful blog. You wrote, “people generally welcome my efforts to speak for them.” you’ve addressed this in the past, but I’d love to hear more about when people DON’T welcome your efforts to speak for them. I also love “moving close to a partner can create a mysterious intimacy. 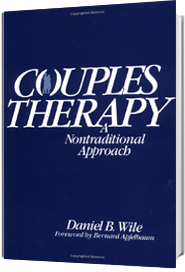 The partner softens and, in response, I do too.” I see this intimacy-as-a-result-of-moving-close-to-a-partner-that-includes-the therapist as the signature gem of CCT. You later mention “I’m showing how it would look if the partners were having a conversation rather than a fight.” I’m reminded of one of my favorite Wile-isms (if I’m paraphrasing it correctly): “the focus of a conversation is to listen to your partners points, while the focus of a fight is to get your partner to listen to YOUR points, or while refuting your partners points.” Thank you and have a Happy New Year.